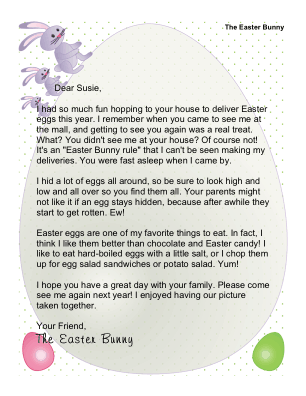 A letter for a child who met the Easter Bunny at the mall. 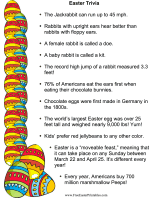 It is intended to be left out on Easter morning. 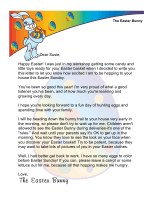 I had so much fun hopping to your house to deliver Easter eggs this year. I remember when you came to see me at the mall, and getting to see you again was a real treat. What? You didn't see me at your house? Of course not! It's an "Easter Bunny rule" that I can't be seen making my deliveries. You were fast asleep when I came by. I hid a lot of eggs all around, so be sure to look high and low and all over so you find them all. Your parents might not like it if an egg stays hidden, because after awhile they start to get rotten. Ew! Easter eggs are one of my favorite things to eat. In fact, I think I like them better than chocolate and Easter candy! I like to eat hard-boiled eggs with a little salt, or I chop them up for egg salad sandwiches or potato salad. Yum! I hope you have a great day with your family. Please come see me again next year! I enjoyed having our picture taken together.